Hill's Prescription Diet provides a wide range of clinically proven nutritional solutions which support your pet's specific dietary needs. 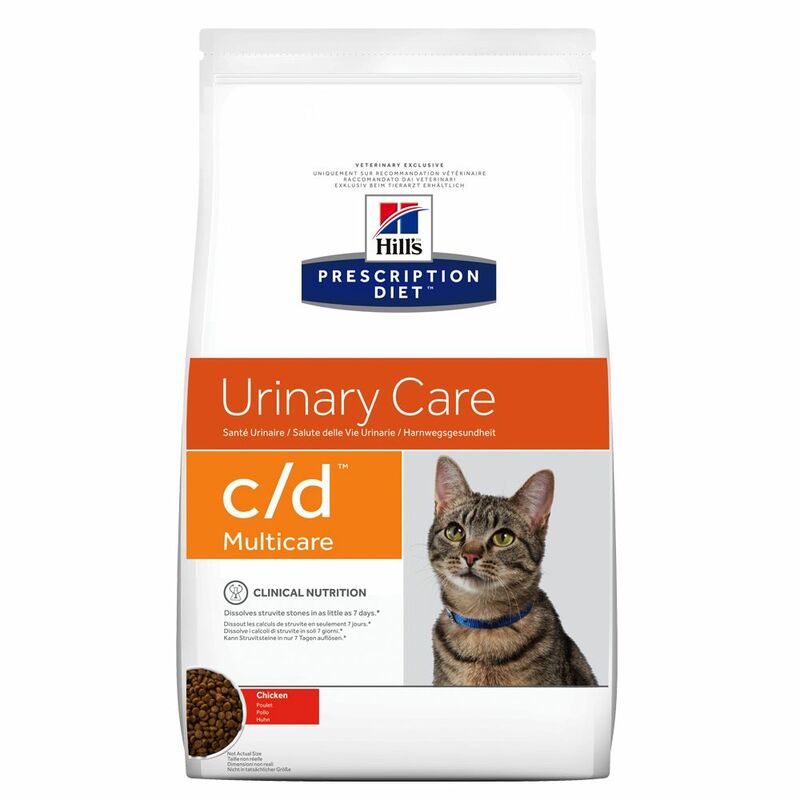 Hill's Prescription Diet Feline c/d Multicare Urinary Care with Chicken helps to keep the urinary tract healthy and leΒens the risk of struvite stones. Many cats suffer from FLUTD (Feline Lower Urinary Tract Disease), a complex, painful disease of the lower urinary tract, frequently aΒociated with the formation of crystals which can lead to bladder stones. The two most frequent types of crystal which form in the urinary tract are struvite and calcium phosphate. Hill's Prescription Diet Feline c/d Multicare Urinary Care with Chicken helps to reduce both of these types of urinary stones. Struvite crystals and stones tend to develop because of too much magnesium, ammonium and phosphorus in the urine and an alkaline urine pH. Hill's Prescription Diet Feline c/d Multicare Urinary Care with Chicken at a glance Low in salt for healthier kidneys Can help to prevent struvite, oxalate stones, plugs, FIC which can cause FLUTD Helps to diΒolve sterile struvite stones and reduces the risk of recurrence Can be used long-term Important information Not suitable for kittens which are still growing Not suitable for pregnant or lactating cats Do not use together with products which make the urine more acid. Price just £52.99! Click here to buy now!